We crafted our roster of payment methods in a way that allows you to confidently make deposits and withdrawals. Security should always be a top priority for any binary options broker. And so we have provided you with vast Banc de Swiss payment methods that offer not just security but also banking convenience. One of our reliable payment options is the Banc de Swiss Moneybookers option. With millions of users trusting Moneybookers, you can do your banking needs without worrying about your financial information getting leaked somewhere or being hacked. We made the Banc de Swiss Moneybookers as one of our accepted wire transfer methods, so that you can enjoy the convenience of such an advanced payment option. With Skrill or Moneybookers, all you need is your email address and password. There’s no need to remember other account details and repeatedly input them when making payments. 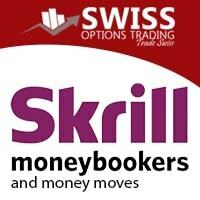 In addition, our Banc de Swiss Moneybookers method doesn’t require any registration fee. This way, you get the benefits of hassle-free banking with your very own free account. Once you decide to use the Banc de Swiss Moneybookers payment method, you get to enjoy the exclusive perks of a Moneybookers account holder. These include a Skrill digital wallet, extensive security measures, a Moneybookers MasterCard, and many more. Another great feature is Moneybookers’ instant payout, which is available in over 40 currencies from over 200 countries worldwide. With this payment method, you can safely deposit funds to your trading account. It also enables you to withdraw just as easy through our Banc de Swiss Moneybookers banking option. Furthermore, you can start using your funds for trading after it has been processed within 2-7 days. Likewise, our Moneybookers payment method also allows you to withdraw your earnings after processing your withdrawal request in 2-7 days.